Adventure X was an expo that was held in the UK on Saturday and Sunday, December 17th 2011. It was a humble gathering of Adventure Game fans, Point and Click lovers and Game Designer and Developers from all over the world (mostly the UK). This marked the debut of the event and since then it has been a yearly thing. Entrapment had the privilege of being one of the games that exhibited at the first event. I was also there personally to answer questions about Entrapment, Scared Square Games (which was known as Lightbulb Games back then) and also to have some friendly chats. Above is a video of highlights from the event. The movie contains the talks by Chris Bateman and Neil Rennison and also a few words from me about Lightbulb Games, Entrapment and the AGS Bake Sale. Next, I met Stuart Lilford, director and designer of Lightbulb Games, who had brought along his little gemEntrapment, run on AGS, for me to try out. With “classic low-res goodness” and pointedly sarcastic comments from the main character, this demo game is well worth the time and effort put into its creation. You wake up in a sleazy hotel, with a corpse in the room you don’t remember, and an essay on the window explaining that there have been episodes of sniper elimination of cheating partners who have tried to escape in the past, hence the bars, instead of a simple “it’s locked”. I really enjoyed the selectable environment that had clearly taken much thought, red herrings and multiple options to make the experience unique every time you play. Hmm, I think there was a reason I didn’t first try the door… oh yes, that’s right. Because of the huge BOMB attached to it. The AGS Blog – We find out more about the background and the Development of Entrapment. Cubed Gamers – Will Ross of Cubed Gamers who attended Adventure X asked me about the future for Lightbulb Games (now known as Scared Square Games). That’s it for the old Entrapment Development Diaries. Entrapment will be available to play again from this Wednesday! So keep an eye out for the announcement. 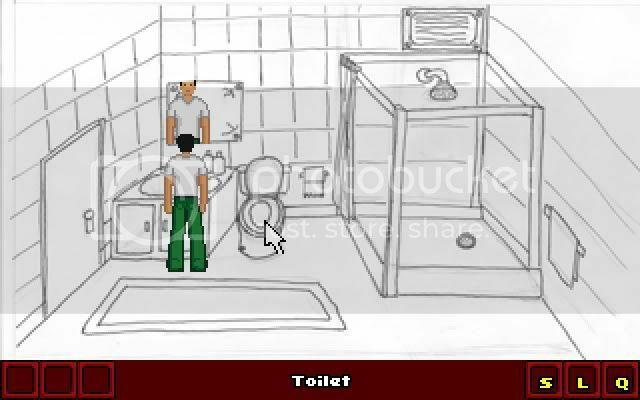 The following is a screenshot of the prototype for project: ‘Entrapment’. Entrapment is an adventure game with a story written by me. Of course the artwork is simply placeholder, but I’ve been mostly working on the code/script for the game. It has been created using Adventure Game Studio. 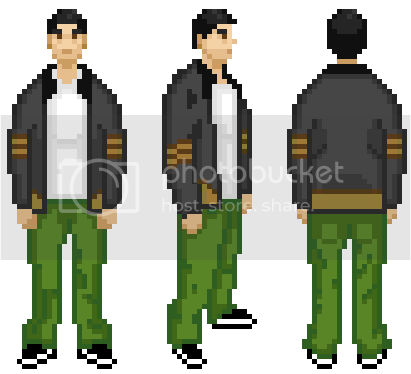 Looking back at the prototype, I can already tell that my artwork has improved since then. With the prototype, I sent it out to testers and got some feedback on the game. I think it was around 3 people in the end, who gave up their time to play this awful demo. They mostly were saying to keep going with it and they were looking forward to seeing it finished. I’ll be updating with more Entrapment posts in the coming weeks/months/however long it takes to get it ready. Maze Defender is a small game which was designed and developed by Stuart Lilford. You control the turret in the center and you have to shoot the aliens as they enter the spiral maze and stop them before they reach your base. The idea came to me while I was in Lanzarote. I had a penchant for ‘Tower Defense’ games at the time and I had to come up with a small browser-based game to make in Macromedia Director 2004 for University. During lectures, we began learning lingo script by creating a crude version of the classic Space Invaders, this led me to thinking about different ways you could alter Space Invaders basic game mechanics to create an original experience. With Maze Defender the turret, that would be at the bottom of the screen in Space Invaders, is in the center and the aliens are still aliens, but instead of coming down, they go in a spiral. So really there are only two differences in core gameplay between Space Invaders and Maze Defender. I decided to jazz up the gameplay a little by adding a power up. Once in a while a power up will come through the maze with the aliens. The aim is to NOT shoot this and let this reach your base in the center. The effect? temporarily slowing the aliens down so that you can shoot them easier. I think in the end I finished it with 15 levels, with four different aliens to shoot. What would I do differently? Well, if I am honest, the game gets a bit TOO difficult towards the end. You know something’s not right when you’ve designed created and tested a game and even YOU can’t complete it. Still, I received an an A grade for the finished product, but why not try it yourself?